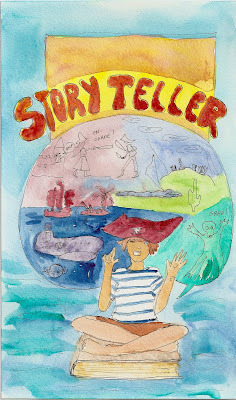 This is for the prompt of the week at Inspire me Thursday, it was "storyteller". I couldn't not try to make something with this! I almost didn't make it in time, and I almost managed to talk myself out of it because I thought it was too difficult for me but I tried, and drew this while my daughter was doing her homework and sighing a lot beside me. It's a bit akward but I like it anyway. Especially in this small version where the errors don't show as much! This I made quickly tuesday evening after a crappy day at work. 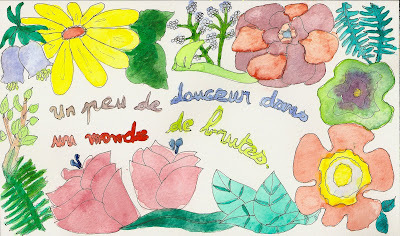 It says "un peu de douceur dans un monde de brutes", and it means "a little bit of softness in a brutal world". It was the words in a TV add for chocolate, a few years ago : ) It worked, I felt better! Love the storyteller! I think it illustrates quite well how they spin a whole world of their own. They're great to listen to and to visit their world. The storyteller is wonderful. I like that she is sitting on a book too. It's nice that you can escape a bad day by drawing and painting. Lovely, uplifting paintings. Just can't help but smile! I liked your "therapy" piece for the bad day at work. It looks so happy and fun - glad you made it. I love your storyteller...you did a great job. Hope your days have gone better for you! Lovely picture .. like the way she sits on the book with a pirate hat flying in air telling all the stories of her travel.. I have presented you with an award on my blog...Pop in and pick it up at you leisure! :) Spread the JOY! Goodness I so relate to your "a crappy day at work. I'm amazed you can create after a "life's" draining day at work. You inspire me to create because i'm never going to be less "tired." What a feel good post! I love it!